White powder cakes the faces of two giddy Norwegian girls. They huddle together for a quick confer, giggling. Do I ever. Suddenly, $159 doesn’t seem like much money. Of course, I have alread had two $159 bumps, but it’s better to relish the rush than mourn the money. Just focus on the soul-swelling ecstasy waiting on the other side of the credit-card swipe. “I’m in,” I say, ducking into Aaron Brill’s bright yellow Eurocopter AS350 B3e heli. A loud minute later, we are awash in feathery snow, hunkering under the windy whine of rotor blades. Below us, a curtain of pristine San Juan powder drapes across reefs of jagged rock. One by one, we send rooster tails billowing into the blue. Panting, we regroup on the valley floor, cheeks flushed as we tap celebratory poles. Halfway down the road back to the base, I drop into a tuck, resolved to shake The Pusherman. But his grasp is strong, and I unconsciously skid to a halt at the helicopter. It’s sleek, alluring appeal is too powerful to pass up. Just another $159, I think. I’ll stop buying fancy coffees. Start packing my lunch. My daughter doesn’t really need piano lessons. The Pusherman, is grinning as he rides his snowboard up to his dope machine. “Fun, right?” he says. Brill—and his wife Jenny—are the founders of Colorado’s Silverton Mountain. They are also drug dealers. They admit it. They are the Walter Whites of skiing, peddling only the purest goods. The addiction starts innocently enough at the Brills’ Silverton Mountain ski area, where a single chairlift ferries skiers to the best terrain in Colorado. But after a taste of the good stuff—an effortless minute in the helicopter—riding lifts isn’t always enough to sate the jones. It’s a growing abundance of take-my-money-now powder addicts who have spurred the Brills to step up their game. Over the course of the last nine years, the Brills have become the largest powder dealers in North America, accumulating permits for more than 15 million acres of helicopter-accessed terrain in Alaska, the powder junkie’s Nirvana. On May 1 last year, Brill sold out all his 2016 Alaska helicopter trips—nine weeks in March and April in the Northern Chugach—in a few hours of frenzied booking. He sold out the 2015 season a year earlier in about the same time. Brill could likely sell nine weeks with another heli in the same few hours—but that would be the same path taken by the nearly dozen other heliskiing outfitters operating in Alaska. Brill likes to break trail. “So I thought, instead of expanding capacity, why not expand the season. There’s no reason, if this is the best skiing in the world, which it is, to not want to ski it every day,” said Brill, who spent the summer skiing southern Alaska’s north-facing lines above the fishing village of Seward down to the barreling waves of Resurrection Bay. Brill tested the waters in November and quickly sold out weeklong heliskiing trips out of a lodge in Seward, which counts the winter, like most Alaska towns, as off-season. Brill started accumulating heliskiing permits on a whim in 2007 during a down day at a buddy’s heliskiing bachelor party. By 2008, he was hosting clients who collapsed in airstrip-parked RVs after skiing more than 50,000 vertical feet a day. He quickly developed a loyal following of heliskiers. They are drawn to his unique model, which puts two guides with each group of four skiers and goes directly to the steep-and-deep, eschewing the traditional model of easing clients into bigger terrain. Brill vets Alaska clients in the heli at Silverton Mountain, testing their skills in Colorado’s San Juans before booking them for the big-boy terrain in Alaska. And he started gathering more permits. He’s got a million acres under permit in southeast Alaska’s Petersburg. He’s got close to 12 million acres in the Northern Chugach around the Knik River. And now he’s got 300,000 acres above the coastal fjords of Seward. The three bases each have their own distinct weather patterns, snow and mountain topography. If conditions turn sour in one spot, chances are good it’s firing in another. 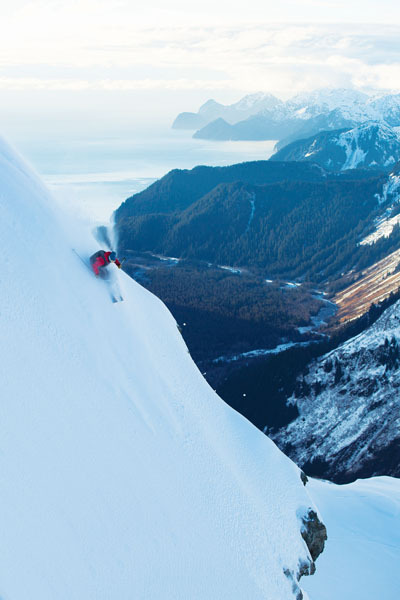 The early-season in Seward is a powder zealot’s dream. The snow falls deep, accumulating as much as 13 feet in a week. It’s that maritime snowpack too, so it just clings to near-vertical faces. The sun rises around 10 a.m. and sets around 4:30 p.m., leaving plenty of time to punish quadriceps. The light, which goes from deep purple to neon orange, perpetually lingers in the magic moment that lasts mere minutes down south. At night, the sky ignites with the green-gassed Aurora Borealis. The lines can run 5,000-vertical feet or more, with shorter, high-altitude shots down to glaciers that stretch to the horizon or thigh-burners that descend into remote bays where waves pound black-sand beaches pocked with ice and snow. Brill pulls out his phone and shows a video from August. The heli is parked on the sand. His guides shed their ski gear and surf waves at a very lonely break. Eureka! Brills’s now thinking about offering a ski-and-surf package at the end of the season, maybe call it Blower and Barrels. It’s yet another scheme from the pied-piper of powder, part of his plan to seed a continent of pie-eyed junkies scraping between the couch cushions for helicopter funds. Back in Silverton, it’s barely 10 a.m. and I’m about $500 deep. “You’re more than halfway there already,” he says. More skiers are flying down the track, slowing down to marvel at the gleaming helicopter, the greatest toy ever made. The Pusherman starts his pitch. He sets the hook. Two freshly powder-frosted fiends grab for their wallets and sign the Pusherman’s paperwork, abandoning every possible legal right they could have. The Pusherman twirls his gloved mitt. The machine starts to scream. I duck my head and crawl inside.